There are many harbingers of Spring in Swoope; the yellow blooms of daffodils and forsythia, the sounds of spring peepers, and pastures changing from brown to green are only a few. My favorite harbinger of Spring is the arrival of Tree Swallows, Tachycineta bicolor. I start looking for them in late February. This year they arrived in Swoope on March 18. Our Tree Swallows migrated almost 2,000 miles North from Florida and Cuba. They come here to breed and raise their young, returning South in the fall. We maintain forty-eight nest boxes for them and other cavity nesters such as Eastern Bluebirds and Carolina Chickadees. There must be a hundred Tree Swallows along Trimbles Mill Road and the Middle River. There are often two or three birds around each nest box. Anytime we drive a truck or tractor into a pasture it disturbs insects. The Tree Swallows come to get them. They are joined by Barn Swallows, Cliff Swallows and Northern Rough-wing Swallows in the feeding frenzy. It’s an amazing show of flight with colorful dives and swoops. 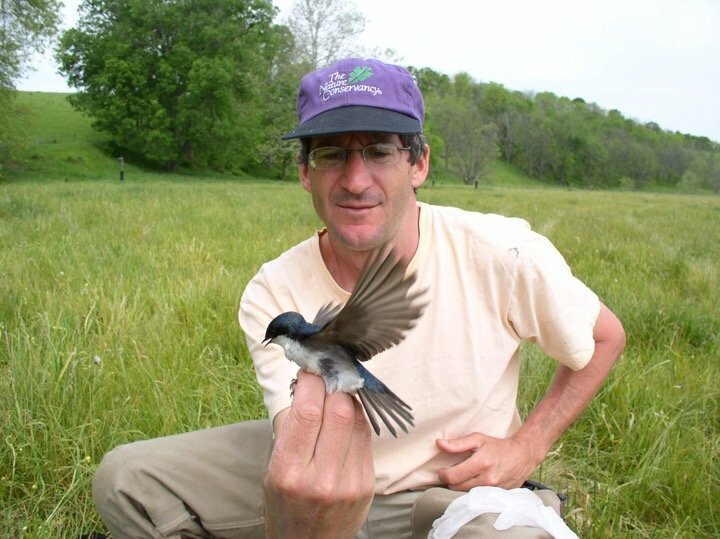 We have always had a few nest boxes but in 2005 Dan Cristol, Chancellor Professor of Biology from the College of William Mary asked us if we would participate in a research project to study the biomagnification of mercury up the food chain. He and his students put up hundreds of nest boxes along the Middle, South, and North Rivers in Augusta County. On our farm, they added thirty nest boxes to the ones we already had. Waynesboro, Virginia, was the site of a Dupont synthetic fiber production plant that discharged mercury into the South River from 1930 to 1950. The Middle and North Rivers were used as reference sites in the research because they didn’t have legacy mercury discharges in the River. Tree Swallows were their main species of study because during the breeding season they eat only flying insects. Insects such as mayflies, dragonflies, caddisflies, and stoneflies spend their immature life in streams and rivers. The ones in the South River spent their aquatic life in the sediments contaminated with mercury. When these aquatic insects hatch from the water becoming flying insects, many are eaten by Tree Swallows. Subsequently, they feed their babies these insects and they, in turn, ingest the mercury. Their studies proved that mercury, in fact, does biomagnify up the food chain; twenty times higher than in the reference birds on our river. Their six years of field research was, to their knowledge, “the first study to suggest disruption of multiple endocrine functions by mercury in wild animals,” one research paper attests. Cristol and his students published over fifty papers on their findings of mercury in wildlife. “The mercury-exposed swallows suffer a reduced hormonal response to stress, altered thyroid hormone levels, suppressed immune system, twenty percent fewer offspring annually, and most interestingly, a greatly reduced ability to withstand heat waves. Normally hot weather is great for them because of the increased number of insects flying around, but on the contaminated sites, that is when the babies tended to die…so there is trouble ahead when mercury and global climate change run into each other,” Cristol wrote. The William and Mary field research ended in 2010 but we still maintain the nest boxes and added even more. It is a joy to see their metallic blue/green upper bodies and white breasts flying around the pastures in pursuit of insects. Their research was used as part of the South River/South Fork Shenandoah River Natural Resources Damage Assessment Plan which led to a settlement from Dupont of $48 million to various environmental organizations to improve our landscape and waters. This is the largest natural resource damage settlement in Virginia history and the eighth largest in US history. The College of William and Mary was a member of the South River Science Team that used research to understand, educate and reduce the effects of mercury in the South River. We are very proud to have been a small part of this massive research project that resulted in some form of environmental justice for the decades of mercury contamination of a major river. This entry was posted in Blog entries, Contaminants, Migratory birds, Science and research and tagged contaminants, Migratory birds, research, settlement, tree swallows, Virginia on May 29, 2018 by isaacburke94. The One Health Initiative promotes the idea that human, animal, and environmental health are all linked, so by changing one aspect of the triad you inevitably affect the rest. This initiative encourages collaboration across a variety of scientific disciplines to create synergist approaches to large scale health issues. Recent mortality events in populations of the country’s smallest turtle have provided an opportunity for the U.S. Fish and Wildlife Service to do just this—to bring together partners across a variety of disciplines to explore an issue that could be affecting more than the bog turtle. Bog turtles, the smallest turtle in North America, are federally listed as a threatened species under the Endangered Species Act. Although these turtles are small they are mighty! They have a lifespan of 30+ years and remain almost exclusively in the same wetlands where they hatched. They have become threatened primarily as a result of degradation, fragmentation and/or destruction of habitat, due to human activities. In 2011, bog turtle populations in New York and Massachusetts had unexplained mortality events and individuals were showing clinical changes in their skin that included discoloration and ulceration. This puzzled many biologists and prompted a response to figure out what was causing the mortality. The U.S. Fish and Wildlife Service (USFWS) decided to fund a project involving Wildlife Conservation Society (WCS) veterinarians, pathologists and technicians, and state biologists to conduct health assessments on bog turtles at 4 sites in these two states. Previous research on other turtle species suggested that infectious diseases, such as Mycoplasma (an upper respiratory tract disease), could be an important contributor to mortality. WCS was unable to determine the actual cause of death, but the research did confirm the presence of Mycoplasma. Tests for ranavirus and herpesvirus came back negative. Unfortunately, additional research efforts have had mixed results. Additional assessments in Dutchess County, New York, were negative for ranavirus as well as Mycoplasma, but were positive for herpesvirus. Data from New Jersey suggests that there is a high prevalence of herpesvirus in bog turtle populations in that state. Recent results from a 2017 study in Oswego County, New York, indicated that all the sampled bog turtles were healthy. Ultimately the disease prevalence is highly variable and additional testing is required to understand the disease distribution within a variety of bog turtle populations. 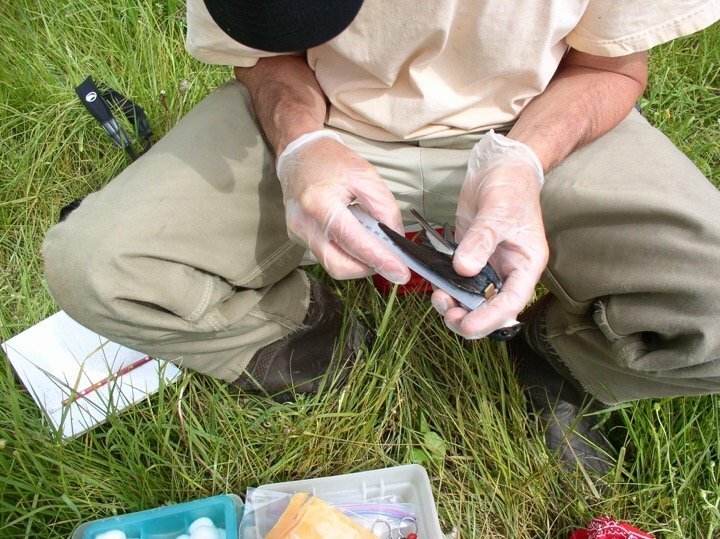 The 2017 study, funded by USFWS, allowed WCS and the State University of New York College at Oswego (SUNY Oswego) to assess turtles at a site that is far removed from other parts of the bog turtle range where positive disease detections have been made; it was of particular interest to better understand if bog turtles at this site carried the same diseases. While there were some old injuries observed, and very occasional unexplained minor discoloration of skin, the sampled turtles were in very good condition. Continuing to study this species is important because by better understanding these unexplained mortality events we can support a more robust wetland habitat system and ideally eventually recover this species (hooray!). There are a lot of unknowns in this project like how climate change may play a role in bog turtle populations and whether a changing climate will trigger more disease impacts. The continuation of research efforts will allow more knowledge to be gained to help protect this species long term. This collaborative effort remains on-going to protect this tiny turtle and to better understand the impacts to habitat and disease. The more we can encourage and work together toward common conservation goals the better we can promote and protect the biodiversity of our world, one tiny turtle at a time. This entry was posted in Blog entries, Endangered Species, Partnerships, Science and research, Wetlands and tagged bog turtle, Massachusetts, New York, research, SUNY Oswego, wildlife conservation society, wildlife disease on December 21, 2017 by sophietrowbridge. This story is a part of a Native American Blog Series in observance of National Native American Heritage Month. During the peak of fall in September, visitors to the Fort River Division of the Silvio O. Conte National Fish and Wildlife Refuge time-traveled to the ancient Native American heritage site of the Norwottuck people (who belong to the Algonquin Native American culture). Travelers stepped back 8,000 years to discover that many Native tribes lived and thrived in the Connecticut River watershed for thousands of years. Guests excavated in a sand-box archaeological dig, viewed projectile point arrowheads used for subsistence hunting and fishing by Native Americans thousands of years ago, and learned about the 1630’s contact period of European settlers. Visitors finished their journey into current day, knowing that Native American Nations still embrace their culture and practice their sovereignty in Massachusetts and across the United States. Walking along the bridge, visitors realized that beneath them lay thousands of years of important history that lives on in the culture of Native American Tribes today. As the Jr. Native American Liaison for the U.S. Fish and Wildlife Service, I was able to tell this story and share my Native culture in the process. In late May, I joined the Student Conservation Association internship with the U.S. Fish and Wildlife Service having never been to the Northeast before. Coming from the prairie and Black Hills of South Dakota, Massachusetts was a long way from home. However, I was passionate to serve Tribes in whatever capacity I could. I now work with Southeastern and Northeastern Native American Tribes through my position. As an Oglala Lakota-Sioux Native American, I sought the opportunity to learn more about Tribes closer to the Atlantic. Researching technical reports of the Fort River Division creation (containing archaeological information), New England Tribes encyclopedia (Bruce, 1978), and “Historic and Archaeological Resources of the Connecticut River Valley” (Galvin, Massachusetts Historical Commission), I learned the rich past and present of Tribes along the Connecticut River. Using creativity, passion, and accredited resources, I designed a Native American Storybook of the Norwottuck, Algonquin people. The 28-page story was displayed on kiosks along the Fort River Division 1.2 mile loop trail throughout the month of September. On Saturday, September 16th, the U.S. Fish and Wildlife Service, invited the public to join them in activities to go along with the Storybook. Through partnership with Tim Binzen, the Service’s Native American Liaison for the Northeast and Southeast, and Eric Johnson, the University of Massachusetts-Amherst Archaeologist, projectile point artifacts were on display for visitors. Children, parents, students, and trail-walkers alike, got to hold an arrowhead dating back 8,000 years. Later in the month, the External Affairs office of the Northeast Regional office of the Fish and Wildlife Service also visited the Storybook Trail at Fort River and each individual had the opportunity had to read a page from the story of Keme and Sokanon. Tim Binzen mentioned that all projectile points tell a story of the people. These points were shaped differently and specifically for different uses and those methods were passed down from generation to generation. Christine Eustis, also a U.S. Fish and Wildlife Service employee and visitor to the Storybook, mentioned that she had learned so much. She looks at wigwams and tepees with a different perspective and she understands more of the Native Americans of this area. Several visitors can now identify jewelweed and pokeberry, plants that were and are important to New England Tribes. Keme (thunder in Algonquian language) and Sokanon (rain in Algonquian language) are fictional brother and sister from the Norwuttuck Tribe in the Storybook, who explain their story of seasons, cultural activities, and timeline events of their home. The Storybook concept is designed for children, but we can all learn from it. At the end of the story, Sokanon and Keme discuss the sovereign nations recognized in the United States today. In fact, there are 567 federally recognized Tribes in the United States. including nine Tribes in Massachusetts, seven of which are state-recognized. This entry was posted in Blog entries, National wildlife refuges, Outdoor recreation, Youth and tagged archaeology, Community Outreach, cultural resources, culture, education, fort river, Historic Preservation, history, Local communities, Massachusetts, national wildlife refuge, native american, native plants, outdoor education, research, Silvio O. Conte, student activities, university of massachusetts on November 22, 2017 by jrnativeliaison.